Hunting dogs are in incredible physical condition, but you still have to check up on them every so often to make sure they’re staying healthy, especially during long hunts. 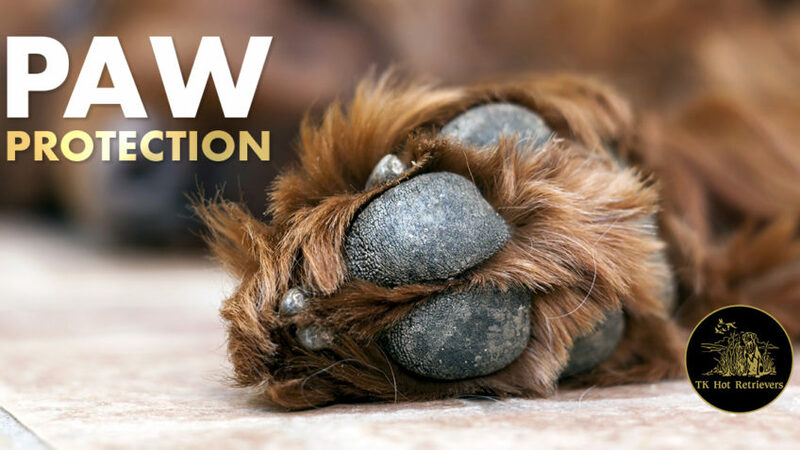 Be sure to pay extra close attention to your dog’s paws to ensure they aren’t in pain with the extra miles they are taking on during hunts. Here are some tips for protecting their feet! The best way to protect your dog’s feet while hunting is to know when their feet are hurting! If your dog seems like they’re tip-toeing around, that’s usually a good sign that they’re in pain. Check their feet periodically to make sure they haven’t acquired any cuts, bruises, or scrapes along the way. Any signs of blood should be treated immediately with your hunting first-aid kit. This may sound simple, but understanding your dog’s limits is very important for working with a hunting dog. If your dog’s feet get sore easily, take it easier on your poor pup! Terrain makes a large difference in how your dog’s feet respond to extended periods outside, so take your dog out on some test runs to see how their feet handle it. Some dogs like flushing and pointing breeds have tougher feet than others, so knowing your dog can make all the difference in protecting their feet! Dog boots can protect sensitive feet from rough terrain and the cold! Rocks and frigid terrain are the most common causes of raw, sore feet, so investing in a good pair of booties may be worth it! Tape the boots on snugly so they stay on longer, but watch your dog’s reaction when you tape them to make sure they’re not too tight. Dog boots are a great way to keep your dog’s toes warm and comfortable. Plus, they’ll make a fashion statement while you’re at it! Your hunting dog may seem invincible, but realistically, their feet are very sensitive! Be careful and cautious when bringing them along for long hunts, and check their paws consistently to keep your hunting dog’s feet pain free!